In general, propaganda is the dissemination of information with the purpose of influencing the target audience. The impact can be both positive and negative. Negative propaganda includes propaganda of religious, racial, national discrimination, etc. Such type of propaganda is prohibited by the legislation of many states. Examples of positive propaganda are the propaganda of a healthy lifestyle or the propaganda of reading. Intuitively revolutionary propaganda as a kind of political propaganda perceived negatively. However, the ethical implications of this definition allow us to clarify and rationalize this perception. Propaganda is an instrument for achieving the goal. The instrumentality of propaganda is especially evident during social and political tensions, for example, in a revolutionary situation. 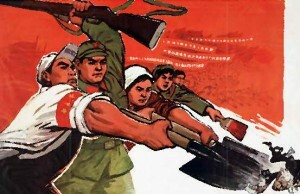 Instrumentality determines the moral emphases of revolutionary propaganda. One of the key tasks of the propagandist is to convince the target audience in the moral purity and truth of the revolution. Moral persuasion can be carried out both with the help of consequentialist and deontological principles. The choice of the strategy of moral persuasion depends on the characteristics of the target audience. Consequentialist revolutionary propaganda is more relevant to the unenlightened and apolitical audience. Propagandists rely on the person’s desire for personal happiness and the value of the target audience. They convince people that revolutionary measures are necessary to achieve a happy, good life. People get together to achieve a specific practical aim. But in the future, these associations can be “converted” into a political revolutionary cells. Deontological strategy of revolutionary propaganda relies on the human desire for a just world order. This strategy can be successfully used in a politically interested, enlightened and well informed audience. However, in this strategy it is necessary too to rely on the values that the target audience trusts. In this case, the task of the propagandist becomes more complicated. First, he must get the necessary reaction from the audience, appealing to a sense of duty or a rational concept of duty. Secondly, he should make people believe that they made a decision on their own. So, the success of revolutionary propaganda depends on how well the propagandist knows the values and norms of the target audience, and how correctly he chose the strategy of moral persuasion.